Lemongrass i Limassol, Kypros: Bestill nå! 2 weeks before arrival. Cancellations must be made by 12 PM 2 weeks before your scheduled arrival in order to receive a refund. Otherwise a non-refundable deposit of 30% of total ammount will be charged. If you do not arrive on the given arrival date, then please note that your entire stay will be cancelled. 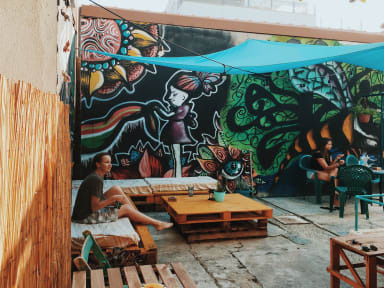 Lemongrass is a small and cozy Hostel in Limassol. Well-equipped kitchen is available to guests 24 hours a day. Lemongrass has various lounge areas: common lounge room, two terraces and a lovely garden. It is a place where you will fill like home, while being in Cyprus. 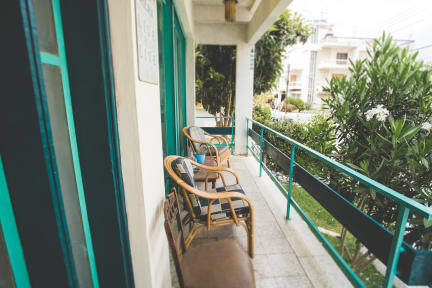 Lemongrass Hostel is ideally located in heart of Limassol, in a safe, quite and secure neighborhood. Just 10 minutes away from the heart of the city's nightlife: noisy streets full with bars, restaurants and nightclubs. Walking a few minutes by foot, you will find the downtown area of Limassol. Among the narrow streets you will discover small local craft shops, workshops, galleries, souvenir shops, food market, and designer fashion boutiques. Most important-only 15min by foot to the beach! We host our guests in shared rooms up to 6 people. All rooms have entrances to a common terrace, lockers and ceiling fans. Each of the bunk beds has a power socket and personal reading light. Payment upon arrival by cash (Euro only).